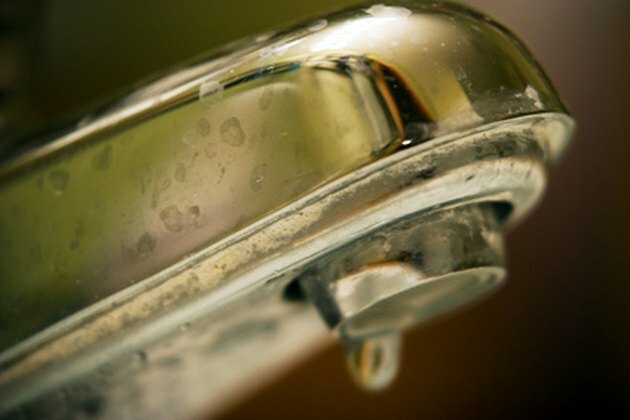 A leaking bathtub faucet wastes water and may leave hard water stains in the tub. Repairing a Kohler tub faucet is fairly simple. It takes some skill with a screwdriver and wrench, but as long as you have the right Kohler replacement parts it should not take more than an hour to complete the job. This fix stops the leak immediately and does not require a plumber. Repairing a Kohler faucet requires special parts. Turn off the water to the bathtub by shutting the water valves behind the shower or tub wall. There is usually an access panel in the wall. Remove the cover on the handle of the faucet that is leaking by prying it off with a small knife. Loosen the screw underneath with an Allen wrench, and slide the handle off of the faucet stem. Remove any retainer clips around the cartridge on the stem with needle nose pliers. Pull the stem insert or cartridge out of the handle. Insert a new cartridge or stem part into the handle after lining up the notches on the side of the cartridge with the faucet head. It should fit flush into the head of the faucet. Slide the handle back onto the stem. Thread the screw through the handle and tighten it with the Allen wrench. Replace the cap cover on the handle by pressing it firmly into place. Turn the water valves back to the on position. Test the faucet by turning it on, and check the faucet for leaks around the handle. Should You Caulk Around Bathtub Faucets?